USDA plant hardiness zone 7 spreads across middle America. It covers much of Delaware and Georgia, spreading west all the way to Central Washington and Oregon. Rose bushes must be able to withstand the cold winter temperature of 0 degrees F or slightly below. Yet, summer temperatures occasionally reach 100 degrees F. It’s best to choose a rose bush that spreads over a warmer and colder planting zone to be assured of the hardiness of the plant in the fluctuating zone 7 climate. 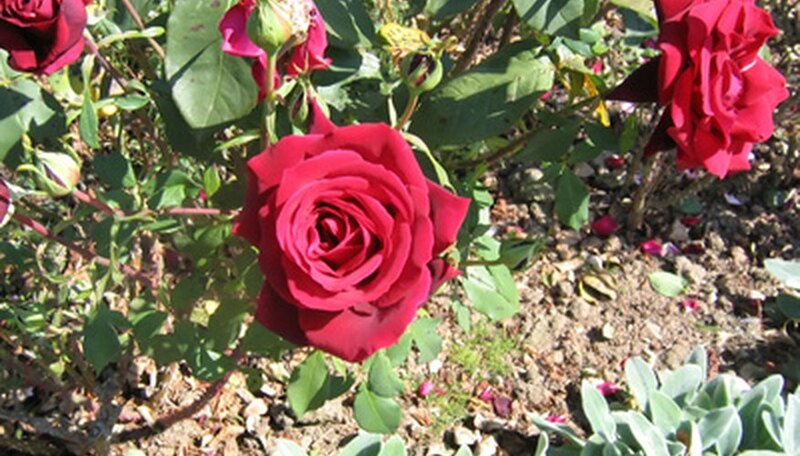 This hybrid tea rose is one of the most elegant of the red roses. Hybrid tea roses are the type used in floral shops, sought after for the long stems, tight buds and large blooms. This rose grows best in USDA zones 5 through 9. If the temperature in your location has an occasional winter dip of unexpectedly colder weather, because of the wider zone range, this plant will come through it just fine. The bush grows to approximately 4 feet or taller. It can, however, appear a bit spindly on its own. Plant three bushes 1 1/2 feet apart to give the appearance of a really full rose bush. The golden butter yellow of the Julia Child rose gives off a soft spice-licorice scent. It is a fitting tribute to the famous chef. This floribunda rose type grows shorter stems with bushier foliage than the hybrid tea rose. It makes up for its less elegant stature with its deep, bright-colored blooms, exhibiting a full, pointed bud. It’s easy to grow because of its disease resistance. The Julia Child rose does well in USDA zones 5 through 8. The bush tends to grow in a rounded shape with an abundance of blooms. This rose bush variety grows to a height of 3 to 4 feet. Belinda’s Dream rose bush grows a large pink bloom. Easy to grow, it is somewhat disease resistant. It blooms from springtime until the first frost. This old-fashioned rose has the long stem characteristic of a hybrid tea rose. It develops an abundance of large double blooms with a raspberry-tinged scent. The foliage holds a green-blue color. The blooms make fantastic cut flowers. It grows up to 5 feet in height and is very bushy, making it a good rose bush to form a hedge. This shrub rose is a heavy feeder. Make sure to fertilize after pruning and as the buds appear, as well as once or twice during the non-growing seasons. Belinda’s Dream grows best in USDA zones 5 through 9.